Last week saw the annual T44U conference take place in Dublin. T44U is an annual event run by TerminalFour. It is designed to allow users of the content management system, Site Manager, to share their experiences with each other, to meet the staff of TerminalFour and to input into the future development of Site Manager. This was my first time at T44U. Last year Gareth and Chris went. As we operate a strict rota system in the web team, it was the turn of me and Steve to make the sacrifice and spend some time in Dublin. Gareth made do with his T44Us conference, which he has told me was a roaring success. The morning of day one was a good opportunity to catch up with the latest developments in TerminalFour and Site Manager. There are lots of promising improvements in version 7. Although we feel that some elements of the interface could still do with some improvement, there have been some promising changes in this area. Chief among them is the WordPress-style dashboard with customisable widgets. I particularly liked the sound of the new chat feature, which could allow you to work collaboratively with another Site Manager user. Worryingly, I have heard some grumbles that version 7 runs rather slowly on Internet Explorer 8. That would be a problem for us. However, we were surprised to learn that almost half of T4’s customers are now using version 7. Given the improved features that are available, we are now considering upgrading sooner rather than later. One major new feature that many of our users may be interested in is direct edit. This allows users to update content in preview mode. Hopefully this will make it easier to update content, although I feel there is still scope for great improvement in this promising feature. The introduction of a pagination navigation object and custom fulltext filenames are other exciting feature that I can imagine making great use of, particularly in news sections and the like. Powerful-looking personalisation features also seem promising and we are interested to learn more about that as we assess version 7 in the coming months. For me, the best part of the whole event was the focus groups that were held on Friday afternoon. I found it hugely useful to participate in these group discussions about certain features of Site Manager. TerminalFour staff seemed really receptive to my ideas, particularly on navigation objects. I think there is great scope to simplify the process of creating navigation objects. Site Manager users from other institutions also frequently report that they are creating several navigation objects that are very similar to each other over and over again. Thinking about ways to possibly prevent this and to simplify the process of creating navigation objects in general was an interesting puzzle to think about. I think in our discussions we came up with some good ideas about how to make this features more user-friendly as a whole, and I look forward to seeing if these ideas can filter through to become real improvements to the feature. I also took part in discussions about publish states. This is a more complex issue than I first thought! It is a real can of worms, but despite the complexities I think something resembling a consensus was reached as to how this aspect of Site Manager should be improved. 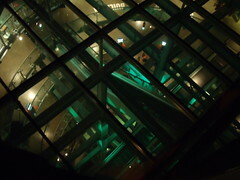 The venue was the Guinness Storehouse. Not only is it one of Dublin’s top tourist attractions, it is also an impressive conference facility. Unfortunately the room on day one was a bit too small. The ceiling was so low that it was quite difficult to view the presenters’ slides. However, that was soon forgotten as we were taken on a tour of the building at the end of the day. It is a cleverly designed museum. The building was redeveloped about ten years ago, and has been designed to look like it has a giant Guinness pint glass in the middle of it! Once you reach the top, you are challenged to pull the “perfect pint” of Guinness. You even receive a certificate upon completion. I cannot express the deep privilege I felt upon receiving one of these certificates, which are no doubt extremely rare. 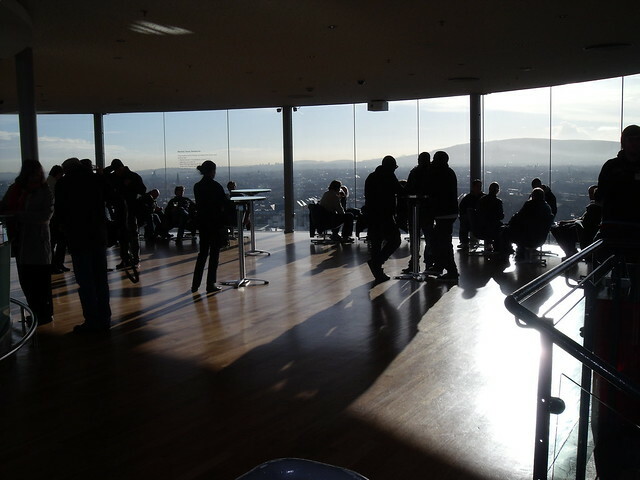 Then it was up to the seventh floor and the Gravity Bar. Going up the lift, you emerge out of the top of the giant pint glass. It is quite a dizzying sensation to suddenly be surrounded by spectacular views of Dublin, seven storeys up. The views from the Gravity Bar are astonishing. In there, we were treated to excellent Guinness-based food (in the form of beef and Guinness stew, and a Guinness chocolate mousse!) and even more excellent Guinness-based booze (in the form of Guinness Guinness). Sadly the music, although good, was a bit on the loud side. This made it rather difficult to do much in the way of talking. So it was just as well the plates of beef and Guinness stew kept on coming.